They're chock full to boot! You can't run away too soon! You will hear the goblins call! In this short lived musical based on L. Frank Baum's 1904 book, The Marvelous Land of Oz, the role of Mombi the wicked witch, was sung by Phoebe Coyne. Her one song was "The Hobgoblins," which occurs early in Act One. As Mombi, Miss Coyne wore a large putty nose and a fearsome wig of red and green. Phoebe Coyne was also married to Woggle-Bug Director, Frank Smithson. in her Garrick Theater dressing room. 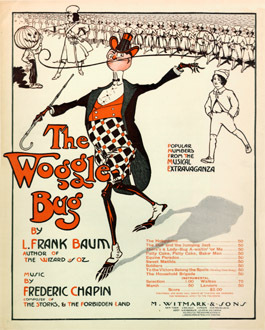 You can download or play a MIDI of this little known song from The Woggle-Bug; or you can download the sheet music in PDF format which will allow you to save it to disc or print copies for yourself.